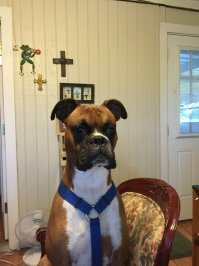 Welcome to The Quilt Ranch in Jasper TX Enjoy our new adventure with us, Wendy and Calvin and Duke, our boxer. Calvin just retired, bought this cute country place and is expanding the quilting and sewing area for Wendy to have room for her stash and antique sewing machines, embroidery & quilt machine, and carry a line of machines to be announced and computers to coordinate and "produce" beautiful quilts and purses and vintage aprons and teach you how to do the same. Come and visit the Quilt Ranch and have a coke with us on the back porch by the shop, looking at the pasture, relaxing, sewing on the treadle on the porch or pick out fabric in the shop or learn how to use your machine. We may even have catfish from the pond cooking on the back porch. We will be doing our best to have a great retail shop for you. See ya soon!